These Visiting Cards are miracles only from the limited human perspective. In fact, these are God’s gentle taps reminding man of the absolute existence of the Divine. Ms. Indira Devi chronicles some of these gentle taps silently serving reminders to man of the absolute need to establish in Greater Faith…as extracted from Sanathana Sarathi. On the first day of June, I was in Bulgaria, having been invited to conduct a Yoga Teachers’ Course by the Minister for Culture, when she was in India. I told her about Bhagawan Sri Sathya Sai Baba and gave her the book, “Sai Baba and Sai Yoga” and showed the film on the 50th Birthday Festival. All this prompted her to drive to Prasanthi Nilayam and she returned greatly impressed by Baba. My visit to Sofia was a beautiful experience. The class of 150 enthusiastic yoga learners consisted of university professors, doctors, engineers, artists and others. I had also to hold classes in three hospitals where the doctors and nurses had to be taught special Asanas and breathing exercises for patients suffering from various illnesses. I had perforce to talk of Baba when questions were asked why I had named the course `Sai Yoga’ and I had to bring forth the japamala of 108 pearls which Baba had given for passing on to the very ill in order to heal them. Many instances of Baba’s Grace were related to me with tears of gratitude by those who learnt yoga from me. Professor B. was sent to me through Government channels in the hope that Yoga, Sai yoga to be more correct, might heal him. For some reason unknown to the doctors, he could walk only for a distance of about 50 meters. At that point, his legs could move no more, though they looked perfectly normal. During 40 years of teaching Yoga, I had never faced such an enigma. I gave him Vibhuti dissolved in water and applied a little on his legs, while he was holding the japamala and praying. The next day, he was normal and could walk miles with no difficulty. At Athens, devotees were eager to see the films and hear about Him. Then I left for California, Mexico, San Salvador and Guatemala. 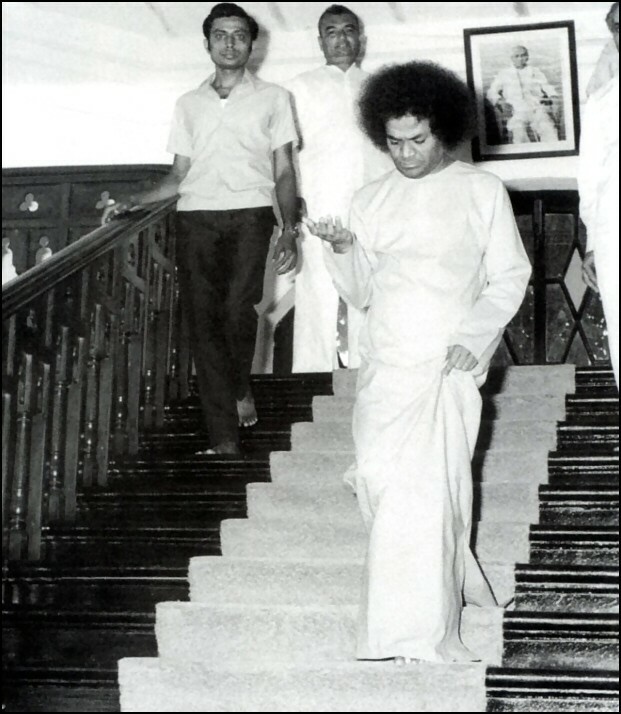 Bhagawan’s message was received with stormy enthusiasm in all parts of Latin America, be it in Mexico, Guatemala, San Salvador or Lima in Peru. His name was on the lips of thousands and it has sunk deep into the hearts of those who have become His devotees. Faith was fertilised by many mysterious happenings in places where Bhagawan’s portraits were adored. In Guatemala, a yoga student had a dream that she was working on a statue of Bhagawan. When her mother came to wake her up early next day, she was surprised to find her fingers covered with clay! Another lady running a shoe store had just returned from Prasanthi Nilayam. She encountered a hold up by three gunmen. They asked for money and she asked Baba for help. Immediately, the fellow who drew out his gun, said, “I was misinformed” and wanted only shoes! Collecting the shoes, they made a fast exit. An armed robbery and all that the gunmen got was three pairs of cheap shoes! In San Salvador, belief in Bhagawan’s omnipresence and omnipotence rose greatly after the miraculous escape of Herandez Quinonez. He with his wife was driving from their ranch back to San Salvador when several assailants stopped the car. At gunpoint, they forced the man to hand over his revolver and 2000 American dollars. While they were searching the trunk, the frightened couple started praying to Bhagawan for their safety. All of a sudden, the gunmen re-appeared in the window and gave back the revolver and the wad of dollars and disappeared into the darkness, leaving both of them dumbfounded. One day at Lima (Peru) Elizabeta Maldonatio took me to the office of her husband, a medical doctor, to show me the room which they had converted into a shrine, since Bhagawan had cured her from an incurable disease when she went with him to Prasanthi Nilayam the previous year. “What do you say of this miracle?” Elizabeta exclaimed, pointing at a large cross of yellow flower petals on the red carpet in front of the altar with Baba’s pictures. “I had placed fresh flowers on these two vases the previous evening and left. By morning, the petals had loosened by themselves and scattered into this sacred shape. Quite a few did not believe the story, the miraculous denudation of the flowers and the mystery of the design which was formed. So, with tears in my eyes, I prayed for a sign. Within minutes, while we sat in meditation, after switching off lights and with only candles flickering, a footprint appeared on the carpet of petals, on the Cross! Baba’s Foot! You cannot imagine what was going on after that! Every one rushed forward to see it and touch it. People fell on their knees, crying and praying, embracing each other in joyful gratitude at this sign of Grace. “But when they were, all finally gone,” said Elizabeta, “the Cross looked very disbaratado (disrupted), because so many petals were missing since people took them home and I had no heart to stop them. Sad and heartbroken, I asked Baba to restore the Cross. Seven weeks later, while the original petals were still fresh and fragrant (! ), He answered my prayer. The blank spaces caused by the over enthusiastic devotees were filled with fresh marigold petals from nowhere.” I prostrated before the altar with the Cross and the Footprint yellow marigold on red carpet! Man’s acknowledgement to the gentle taps from The Greater Heaven!